Monogamy a mating system in which a male and female mate with each other, and only each other, during a given breeding season. Rare in mammals, frequent in birds. Mate-Assistance Hypothesis Males will remain with a single partner to help rear their offspring in environments in which male parental care can greatly promote infant survival. 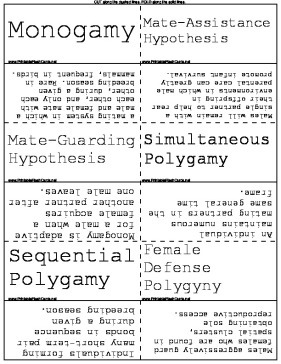 Mate-Guarding Hypothesis Monogamy is adaptive for a male when a female acquires another partner after one male leaves. Simultaneous Polygamy An individual maintains numerous mating partners in the same general time frame. Sequential Polygamy Individuals forming many short-term pair bonds in sequence during a given breeding season. Female Defense Polygyny Males aggressively guard females who are found in spatial clusters, obtaining sole reproductive access. Lek An area used, usually consistently, for communal courtnship displays. Benefits- females choose mates, good for a few males. Polyandry A mating system wherein females mate with more than one male per breeding season. Promiscuous Mating Systems A type of mating system in which both polyandry and polygyny are occurring. Promiscuity Both males and females mate with as many partners and no pair bonds are formed. Polygynandry Promiscuity with bonding wherein several males form bonds with several females simultaneously. Mating Systems and Female Dispersion Patterns Female fecundity- closely tied to availability of resources. Male fecundity- closely tied to access to females. Resource Defense Polygyny Males control acccess to females indirectly by monopolizing critical resources. Extra-pair Copulations Mating by a male or female with an individual other than their primary partner in seemingly monogamous species. Fertility Insurance Hypothesis Reduces the risk that some eggs will remain unfertilized due to mating with a partially or completely infertile male. Genetic Diversity Hypothesis Mating with more males provides more genetic diversity in the offspring and more chance they can adapt to changing environments. Good Genes Hypothesis Social partner is of lower genetic quality than other potential sperm donors. Material Benefits Hypothesis More mates mean more resources or parental care received from the sexual partners of a females. Sperm Competition A situation in which one male's sperm fertilizes a disproportionate number of eggs when a female copulates with more than one male. Cryptic Female Choice The ability of a female in receipt of sperm from more than one male to choose which sperm to use to fertilize her eggs.